When you are a Mom you are always wondering if you are making the right decisions. Knowing your parenting choices will impact your child, you wonder if it was the right choice or the wrong one. Of course children are resilient, and particularly in the first few years, they allow you to learn and grow as a parent too. So will one small wrong parenting choice hurt your child forever? Most likely, No. So it is funny to think that I even agonized for a millisecond about the crayons I gave Eliana to play with today. As a pediatric Occupational Therapist, I had the benefit of working with children prior to becoming a Mom. I think there were several benefits to this - for example, I am familiar with child development. The problem is that sometimes I can be too aware of how children develop. I tend to analyze every toy to make sure there is some type of benefit. I ask myself, "Is this toy helping her fine motor, visual motor, sensory motor development?" I sometimes have to remind myself that playing just to play has its benefits as well. For example, today we were coloring. I looked at the crayons I had given her to use and realized I had given her crayons that were "too advanced". Then almost immediately I thought "Danielle, you can't really give a child crayons that are too advanced". The Mom in me picked the crayons that were most convenient at the time. The reason I first thought "why did you give her the double sided crayons?" 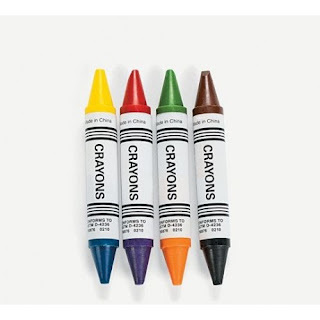 is because the therapist in me would use these particular crayons with an older child to work on a skill called "in hand manipulation", more specifically "Complex Rotation". This is the ability to rotate an object in the pads of the fingers without the assist from the other hand or another object (body, table, ect). To visualize this skill think about wring with a pencil and deciding to erase the last word you wrote. You need to flip the pencil from the pointed end to the eraser end - that is complex rotation. So does it hurt for Eliana to play with these "too advanced" crayons? Of course not! But is she getting all the benefits the crayons have to offer? No. Actually she ended up breaking two of the crayons. These crayons look fancy and fun in the store so they are a little more expensive. At this point in her development all Eliana really needs are fat regular crayons. Developmentally she doesn't have the fine motor skills to color with anything more than a "gross grasping pattern" (fisted palm around the crayons with pinky side toward the paper). At most, she will use a "palmar grasping pattern"(fisted with thumb toward the paper). So when you go to the store and see the vast displays of coloring apparatuses don't be overwhelmed and or think you need to buy the most expensive flashiest crayons. When first starting to color thick (fat/chunky) regular crayons are great. 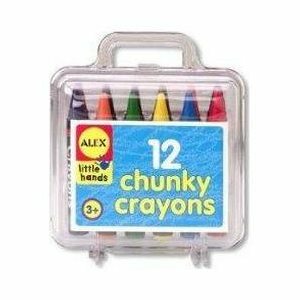 These "chunky crayons" above are great for first timers! 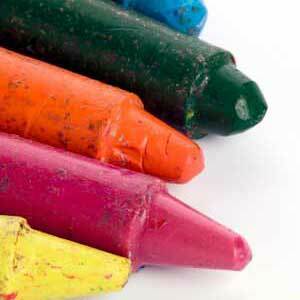 For the next stage of developmental coloring you don't even have to buy new crayons! I will post on how to make your own developmentally appropriate crayons for the next stage - it is super easy - I promise!